The Rusco clear cover is made of high impact polymer resin for maximum strength and durability. The top of the Rusco system is made of PVC. The Rusco sediment filters use centrifugal separation technology to filter sediment from water. The Rusco filtration system has a stainless steel screen filter. The Rusco filter system's filter screen is cleanable and reusable. The Rusco systems have a clear cover that can easily be removed for cleaning. No tools are required to remove the cover. Sediment is visible through the clear cover indicating when the filter needs to be flushed. Rusco Sediment Filters have an open ball valve to easily flush sediment. 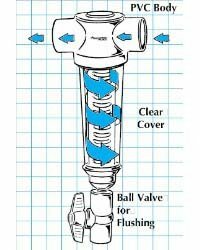 When the Rusco filter is full of sediment, simply open the ball valve to flush the sediment. Rusco water filtration systems are made from molded non-corrosive materials. If you have any questions about this product by Rusco, contact us by completing and submitting the form below. If you are looking for a specif part number, please include it with your message.